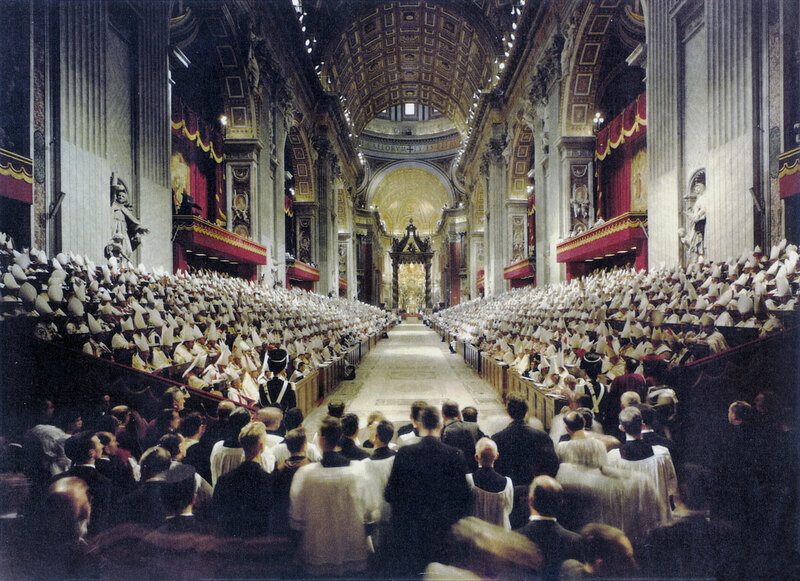 The Second Vatican Council (or Vatican II) was the twenty-first ecumenical council of the Catholic Church. It was convened by Saint John XXIII and lasted for four sessions from 1962 through 1965. It produced a series of documents to direct the life of the Church in the twentieth century and beyond. Saint John XXIII stated that the purpose of the Council was the “modernization of the Church after 20 centuries of life.” This refreshening of the Church's traditions is commonly referred to as aggiornamento (“bringing up to date” in Italian). In his opening speech to the Council the Pope emphaiszed the theme of aggiornamento by stating that "it is absolutely vital that the Church shall never for an instant lose sight of that sacred patrimony of truth inherited from the Fathers. But it is equally necessary for her to keep up to date with the changing conditions of this modern world." The result of the Council was the renewal of Catholic life in almost every aspect: from the language and theology of the Mass to the Church’s role in the world, especially its relationship with other religions. These effects found their way to Carroll College and the Diocese of Helena through the leadership of Bishop Raymond G. Hunthausen (see side note). The following principles of the Council continue to inform Carroll College’s mission. The Council fathers wrote that “the Church has always had the duty of scrutinizing the signs of the times and of interpreting them in the light of the Gospel (Gaudium et spes, #4). In the same way Carroll College continually encourages the entire College community to discern contemporary hopes and concerns in light of its mission so as to give renewed expression to its heritage as a Catholic, diocesan, pre-professional, and liberal arts college. This discernment includes the role of Carroll students and alumni “to guarantee to individuals, to groups, and especially to minorities the right to life, to personal and social dignity, and to equality of opportunity in all aspects of human activity” (Carroll College Mission Statement). Thus, Carroll College aspires to produce graduates ready to engage with and transform the culture. The Council highlighted the role of the laity in the life of the Church by proclaiming that “they carry out for their own part the mission of the whole Christian people in the Church and in the world" (Lumen gentium, #31). As Carroll College experiences, along with other Catholic institutions, the decline in clergy and other religious members on campus, the Council’s prophetic vision reminds us that all members of the Carroll community contribute to its mission and the formation of its students. Bishop John Carroll recognized the importance of the laity as far back as 1916 by declaring the twentieth century to be "the century of the laity." A principle concern of the Council was to promote the work of Christian unity and improved relations among all religions. For the impact of its ecumenical vision on Carroll College, see here. The Council documents emphasize that the Church, as the people of God, has always been on a pilgrimage that concludes with God’s renewal of all creation. Until that time the Church “is signed with a sanctity which is real although imperfect” (Lumen gentium, #48). This pilgrimage includes cultivating the memory of those who have gone before us and have marked the way for us. This powerful image of the Church reminds us that our students come to us as pilgrims on a journey of discovery. Though necessarily incomplete, their formation at Carroll is marked by their encounter with those who embody Carroll’s mission--both past and present--so that their time here is, in the words of Carroll’s motto, Non scholae, sed vitae ("not only for school, but also for life"). Having been appointed the bishop of Helena just four months before the opening of the Second Vatican Council, Archbishop Raymond G. Hunthausen was the youngest and newest American bishop there. A Carroll alumnus (1943) and former Carroll president (1957-62), he was a council father at all four sessions of the Council. His tenure as Bishop of Helena was marked by increased lay involvement in church matters, the establishment of a mission in Guatemala, and an enthusiastic implementation of the Council's reforms. Later, as Archbishop of Seattle, he embraced the challenges of the post-Vatican II Church by emphasizing quality pastoral care for the people of the archdiocese and dedicating himself to ecumenism and multiculturalism. He was also known for his strong commitment to Catholic Social Teaching. In October of 1962 Jeremiah Sullivan was a newly ordained deacon attending the Pontifical North American College in Rome. At the opening of the Council he was standing at the entrance of St. Peter's Basilica with a camera to try and capture the excitment of that important day in the history of the Church. A bishop from the Vatican’s Holy Office observed Deacon Sullivan standing there, and asked him, in Italian, “Young man, do you have any film left in that camera?” “Yes I do,” replied Deacon Sullivan. “Then follow me.” Deacon Sullivan protested, “Your Excellency, I don’t have a ticket.” To which the bishop replied “You do now.” This encounter provided Deacon Sullivan the chance to photograph the opening of the council from within the basilica. The main picture on this page is one his pictures. After ordination to the priesthood. Fr. Sullivan returned to Carroll College to serve as a renowned professor of history. Inspired by the Council, he also wrote Carroll College's mission statement.